This was my entire family’s first opportunity to see The Who play live after years of curiosity having grown up with The Who as the soundtrack to their lives. Our home is a celebration of The Who with framed posters, LP’s, Box Sets, DVD’s and tons of T Shirts all subliminally proclaiming The Who as more than just a band but a force of nature regarded as one of the most important and greatest contributors to modern contemporary music in the world. I set off Tuesday evening with my three precious daughters Jessika, Stephanie and Olivia, son in law Lee and good lady Irene to take up residence in the 3 Arena, where the River Liffey meets the sea in the docklands of Dublin’s fair city. I had a camera with me to let some pictures nourish the memory cells and tell a story in years to come, to share with fellow Who fans on social media, but I passed on trying to get up close to the stage on this occasion tonight being a family celebration in reasonably good seats in the centre of the massive arena. This was my family in the middle of a bigger Who family all here to pay homage to iconic names within the story of modern music on their golden jubilee their 50th anniversary hits tour. The beautiful aspect of a Who concert audience is the mix of musical cultures who have connected with The Who’s music and staked their claim to its importance from 60’s Mod’s, Woodstock Generation, 70’s Rockers, New Wave, Punk, Mod Revival and a whole new generation attracted by their music introducing their favorite TV shows. The Who were the ultimate live rock harmony of guitar, bass and drums on stage when I first saw them live in the 70’s with a mike swinging lead singer leading the charge from the front. Now the two remaining pillars Pete Townshend and Roger Daltrey have assembled a band of top musicians to do their back catalogue justice and present a live performance that is tight and match fit with a superb visual backdrop complementing each song and reflecting the proud heritage of The Who with Keith Moon and John Entwisle embroidered into the visuals never to be forgotten in the great beyond as their drum and bass contributions are cherished and celebrated by Zak Starkey and Pino Paladino in their own capable ways. It was 2013 actually but two years is about 24 hours in rock time. I Can’t Explain chords explode from Pete’s guitar to signal the start of the show. Pete grabbing everyone’s attention as he moves around the stage jumping from power chords to single note runs up the fretboard and bouncing back to the mike for his vocals. The Seeker’s power chords fill the speakers immediately. Roger sings “I asked Bobby Dylan, I asked The Beatles, I asked Timothy Leary but he couldn’t tell me either, they call me the The Seeker I won’t get to get what I’m after till the day I die. The Seeker came out after Tommy and before Live at Leeds one of the many great singles that randomly appeared in the late 60’s early 70’s. 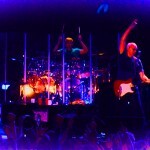 Pete say’s “It’s good to be back” before the band launches into Who Are You a familiar favorite these days for young and old ears because of its CSI theme usage. A song that is tinged with sadness for me as I always associate its release with the sudden death of Keith Moon shortly after in the late 70’s. I was soaking every paper clipping and radio interview around the album’s release when suddenly the narrative changed to bereavement with the film of the studio recording being a fun memory of prankster Keith right up to the very end. I Can See For Miles followed with Pete’s drone chords never sounding better, huge slabs of electric power reverberating around the rafters of the 3 Arena. The cohesion of the larger group of musicians filtered into a sharp powerful tonic filled sound is commendable with Simon Townshend ghosting brother Pete’s guitar playing with empathetic seamless fretwork. Alan Rogan Pete’s tech is at the ready at the end of each song to offer Pete a fresh new guitar for the feast. Pete straps on says “I’m ready” and Zak counts in the beats for The Who to launch into My Generation a song that means so much in the history of rock. The power and energy on stage is now in the fast lane, this is no juke box recital of days gone by, this is great live music being created and arranged by musicians determined to add value and meaning to their job and give the fans a performance that justifies every word of praise and expectation uttered over the years. Roger say’s “You never know in some parts of the world where you are but you never not know when you’re in Dublin. Roger had a great drinking session on the previous night, a night off between the Belfast and Dublin gigs, up the coast in a fishing village called Skerries which is further on up the road from where I grew up in Donabate. Skerries are a good spot for a bit of Traditional Irish music and Craic and Pete was amused that only the Irish would have a village exclusively for drinking. My family’s favorite Behind Blue Eyes had them singing along. Roger may have had challenges with his voice on this tour but he sings this perfectly with beautiful harmonies from Pete and Simon. Pete gets into a preamble about religion and faith next saying he thinks this new Pope is a good guy. Bargain off Who’s Next, my favorite Who album follows and it is a powerhouse performance from the harmony acoustic intro into a full blown reincarnation of the original studio arrangement with extra finesse. I knew the band was going to try out some gems from the back catalogue on this tour and Bargain was my treat of the night. I went into a music store shortly after the album came out in the early 70’s to transition from suitcase compact record player at the time to a stereo with two speakers for the two corners of my bedroom. Who’s Next was playing on this beautiful black and chrome Philips record player and when I walked out of McHugh’s Bicycle and Music Shop on Talbot Street that evening I had both the record player and Who’s Next under my arms struggling to get it all onto the train back out to the quiet North County Dublin village of Donabate which has never been the same since that amazing Glyn John’s produced masterpiece started blasting out the bedroom windows around the peninsula. Shortly after I added a set of disco lights which flashed in sync with the bass and drum notes red green and blue bulbs randomly flashing until someone walking along the beach in the dark one night called the Fire Brigade thinking my bedroom rock lights was our house on fire. Join Together cost me a fortune in a juke box in the summer of 72 with its cacophony of harmonica, Jews harp and drum beats introducing The Who’s call to arms to Join Together with the band. Loren Gold had the Jew’s harp between his teeth sounding the notes with his finger with John Corey playing a large harmonica. No short cuts tonight everything is included in the mix. Someone raises a placard up front with You Better You Bet as Pete is setting himself up for the next song and say’s “That’s a good guess” before playing the opening chords of The Who’s early 80’s hit which seen Kenny Jones on the drum stool. Zak stays faithfully to the original mix but loosens it up with his own Zak / Moonie fluidity. Pete was overheating and paused for a fan to be installed to cool down while Roger performed an a cappella version of Water. Pete’s beautiful finger picking flamenco style acoustic style guitar playing was demonstrated next along with his infectious nasal vocal on I’m The One from Quadrophenia. John Corey played a lovely Keith Jarret style elongated intro in Love Reign O’er Me before it unfolded into all its epic glory with Rogers vocals echoing like a fog horn wafting off the high cliffs of Brighton drifting out to Beachy Head lighthouse. Pete tells us Eminence Front was one of the first songs he sold to television being used for Miami Vice at the time and nowadays used to sell cars in a soaped up rap variation but we were going to get the definitive version. The thunderous rhythms and chainsaw buzz chords of Eminence Front is strikingly impactful. Pete’s early 80’s ode to cocaine with hard edged vocal soars, with equally superb harmonies coming in from Simon Townshend and the back line Frank Simes, John Corey and Loren Gold. Pete introduced us to the origins of The Who’s first mini opera A Quick One While He’s Away inspired by the many creative conversations in the mid 60’s period he had with Kit Lambert which seen Pete remove any demarcation lines and create music that stepped outside the box and paved the way for rock, concept and classical ideas to flourish for a whole new audience. All the segments and visuals are wonderful with Pete admonishing the arrangement at the “ cello, cello, cello, cello ”refrain with one of his grumpy git exclamations: “enough of the cellos”. Great to sit in a Who concert after all these years and have the privilege of hearing this work modernized and performed live by this great group of musicians, just one of the many values and benefits of going to see The Who on this tour. Tommy was celebrated next with Amazing Journey, Sparks, Pinball Wizard and See Me Feel Me all dished up in glorious splendour. Pete’s guitar work is on fire building up the chords and notes on his fretboard into a climax that see’s him soaring like an eagle on stage both arms stretched out to signal another magnificent victory by the birdman of rock who has stood on thousands of stages for 50 years and more and left each audience in a suspension of belief, hypnotised, wide eyed and overwhelmed. Nobody does it better nobody ever will, because within all the aggression and frenzy the wood and wire is interfacing with a personality that is uniquely gifted and driven by a beat Who fans understand, larger than life, articulate often socially awkward, comes across grumpy and impatient from a distance yes but in my book a pure genius of the man and he is entitled to be whatever he wants to be. He is my hero and I am proud of him and I don’t want anything from him other than to enjoy the fruits of his creativity from many more years to come. It was back to my favorite Who’s Next LP then with Baba O‘Riley really getting a unified buzz going in the standing session in front of us. Before long we were out of our seats and performing the famous Baba O’Riley Who salute in tune with those majestic power chords. For me it’s like bi locating at moments like this and I am back in the Vetch Field in Swansea in 1976, Wembley Stadium 1979, Birmingham 1982 and travelling back in time to all those indelible live experience when the exhalation and energy creates an almost out of body experience. Pete say’s “Let me introduce the band” name checking brother Simon, musical director Frank Simes, keyboard and vocal talents in the backline John Corey and Loren Gold, Pino Paladino on Bass with the mention of Zak Starkey resulting in rapturous applause who had been self evidently playing out of his skin all night. 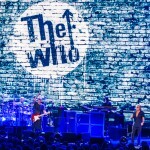 The audience was now on its feet in the packed 3 Arena as the The Who closed the show with Won’t Get Fooled Again with the sound of thousands of voices singing those immortal words “We Won’t Get Fooled Again”. The original Won’t Get Fooled Again single version is my desert island disc and has been ever since walking into a work mates house whose family has afforded a TV aerial that enabled them to watch English channels in Ireland and in time to witness The Who perform their 3 minute rocket fuel version on Top Of The Pops shortly after its release. The Earth stopped turning that night and it has been on a Who revolution ever since. Then it was time to say goodbye, thank you time and time to go home then as Roger again thanked the band members and Roger invited us to applaud the man without whom we wouldn’t have this wonderful music to sing one of the greatest popular composers of the century Pete Townshend. Pete thanked Roger and acknowledged how grateful he was to have worked with him. Pete went on to tell us that we have probably one of the most beautiful fecking counties in the world. 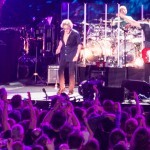 Roger says “ Who would have thought that 50 years later the band that had the potential to not even make it to the weekend would still be here but he wanted to also make the point that the reason for that was down to a very dedicated and supportive audience for which they were very grateful. And so I brought my family home after stocking up with a new supply of T Shirts and paraphernalia and meeting Who mates and friends most of all feeling very proud that they were with me to share and witness such a perfect live music performance from the most powerful and important bands that ever stepped onto a stage. The Who Roar In @ Wembley Stadium in 1979 supported by ACDC, The Stranglers and Nils Lofgren. 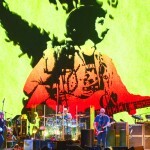 The Who @ Wembley Arena 2000 supported by Joe Strummer and The Mescalaros. 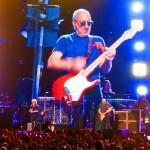 The Who @ Valley Amphitheatre, Marysville Sacramento California 2002 supported by Counting Crows.